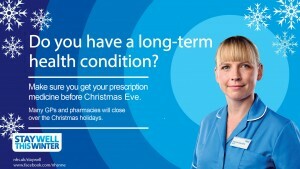 Don’t leave it too late to order and collect repeat prescriptions this Christmas. Running out of daily medication over the festive period could have serious consequences for patients who rely on them to control heart and breathing problems. GP Practices have limited opening hours during the Christmas holidays and the majority of pharmacies will also be closed on Christmas Day and New Year’s Day. The busy festive period can make it difficult to remember the important, everyday things such as ordering repeat prescriptions. This is especially important, as those with long term conditions rely on their prescribed medication to help them keep their condition under control. It’s important to order repeat prescriptions at least a week in advance so that the festive season can be enjoyed in good health. Also double check you are prepared with sufficient over-the-counter remedies so that minor illnesses and injuries can be managed at home. Local pharmacies can provide useful advice and deal with minor ailments without people having to see their GP about winter bugs like coughs, colds, sore throats, stomach upsets and flu.